BPL news about our expansion project! Hello Burlington Friends and Neighbors! It has been a long time since I have written with news about our expansion. We are moving along quite nicely with our plans now that we have worked out all the compliance issues associated with renovating a public space. Downes Construction Company (DCC), our Construction Managers, posted legal notices in the Hartford Courant on January 28 & 29 asking interested companies to submit bids to our Town Hall by 2 pm on Thursday, February 23, 2017. 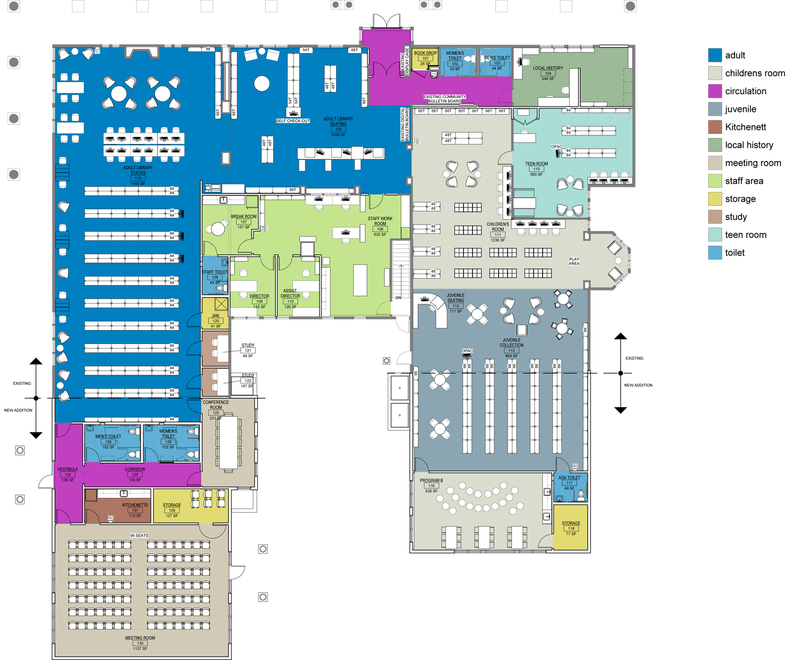 Once all the bids are vetted, our goal is to start construction in April on the two expanded wings of the library. The next step will be to start to reconfigure the original interior of the library, creating exciting new spaces such as a Teen Room and Study Rooms, while better organizing the Burlington Room, our Local History Department. DCC will work around our needs so as to be as unobtrusive as possible. We may periodically need to close the library for an occasional partial day or days, but our goal is to remain open throughout construction. DCC’s timeline finishes the building by October. Excitement is growing as we get closer to putting a shovel into the ground. Below are the plans for the wonderful new expansion. Feel free to ask us questions. This entry was posted in building plans, construction, excavating, expansion, site plans, Uncategorized. Bookmark the permalink. From Concrete to Framing the Building Continues! Trees come down in the east to make room for the expansion.